Wednesday had a little bit of a new look at my house. Being an in home childcare provider is not for the faint of heart. The hours are long and childcare related things extend into personal time hours. I have been open from 7am to 5pm for a long time. That’s 10 hours days for those who are counting. I am always downstairs and prepping for the day by 6:45am. I fill cups, prep meals and get activities out for the day. When closing times comes I often had 15 minutes more of clean up….Changing sheets, reorganizing and putting the last few things of the day away. What people don’t always realize is that there is more time that goes into childcare than that. Often in the evenings there’s book work or extra trips to town for groceries or supplies. It’s long days…This summer I made a hard decision to close early on Wednesdays. Now closing time has moved to 4:20pm rather than 5pm. I know it doesn’t sound like a lot but it’s what I really need. I can leave and get to town, get my things and get back home without wasting a whole Saturday morning on errands. I can’t tell you how much that small changed has made for my attitude. I had one family that ended up having trouble with the change but they had a back up plan so it’s all okay. I didn’t know if I should get it. I haven’t been sewing a lot so why am I buying more fabric? Right? 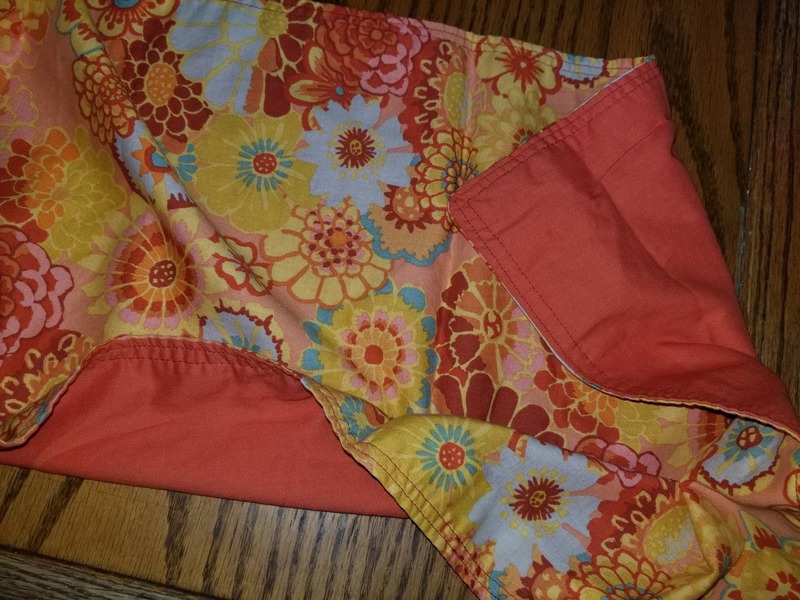 Then I saw something in the bottom of the bag and I thought it was maybe a Kaffe fabric…and I opened the bag when I got home and it….was!! See? YAHOO!! It’s about a yard of fabric all together. There were some fabric that I’ll be passing on…this….It’s heavy weight. The floral is 90″ wide but there is only about 3/4 of a yard of it. I’ll be able to use it for a baby quilt…the pink I’ll save for a charity quilt binding. 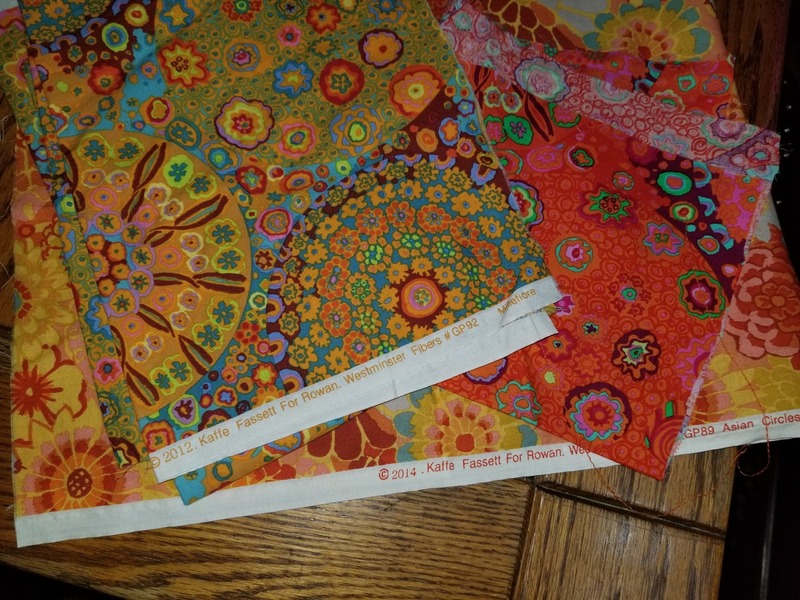 There were a few other goodies that I’m keeping….The sewing machine fabric I’ll give to Kelli for her scrap vortex quilt. The batik for me and the orange piece is a suede. 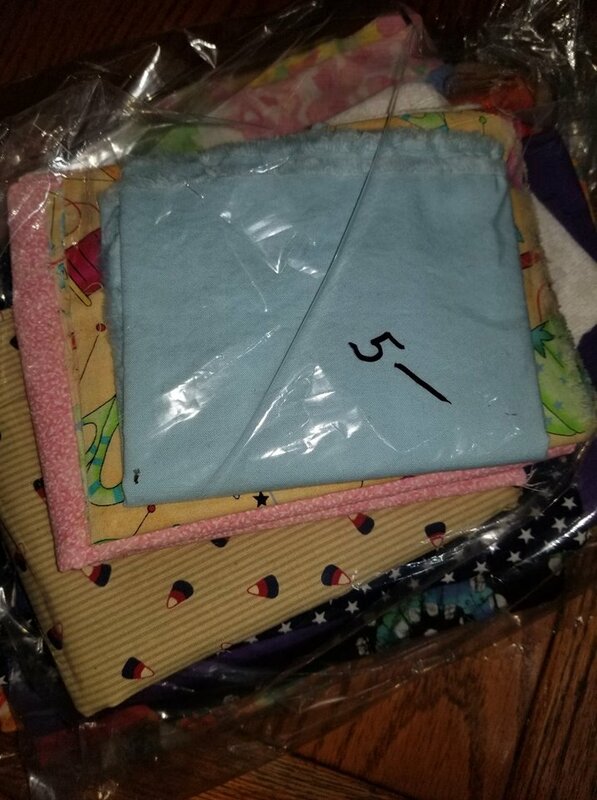 I have a box that I keep potential doll clothes fabric. It will go there for sure. 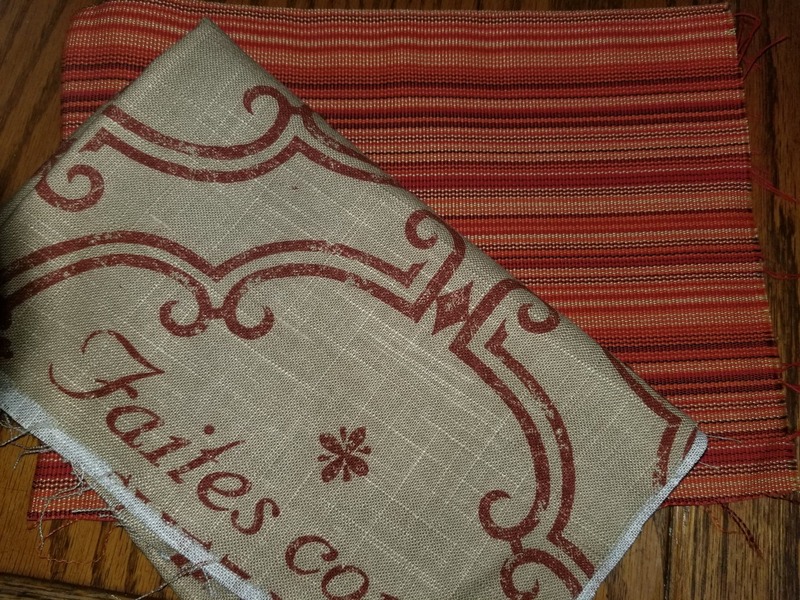 Also in the bag was this…two pieces sewn into a table runner of sorts. I’m going to cut the seams off and make it into fabric again. 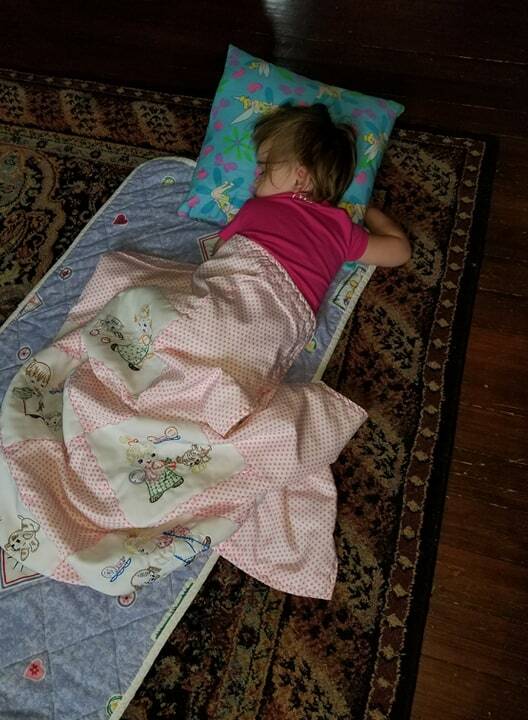 While I was there I found this little quilt…already in use. I grabbed it up right away as it was embroidered. I love embroidery but then realized is was a polyester quilt. UGH. Then I felt it and it was super soft..and super cozy on the back. It was only $2 so I decided to get it. The kids love it….yes, they even fight over it. 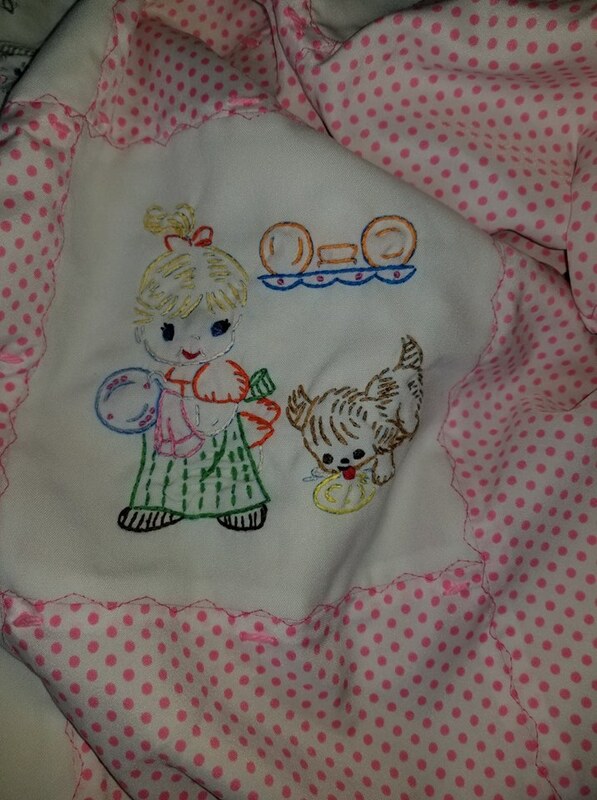 It is known as the puppy/kitty quilt as the embroidered blocks all have puppies or kitties. Who ever thought to embroider on polyester?? Who ever thought I’d meet Kaffe at Goodwill…or get a polyester quilt? It’s part of the adventures that are coming my way now that I’m getting out of work early on Wednesdays. Closing early on Wednesdays (even thought it’s only 40 minutes earlier) is one of the best things I’ve ever done for myself. I originally thought I’d do it for the summer only but nope…I’m almost positive I’m extending it and making it a permanent change. 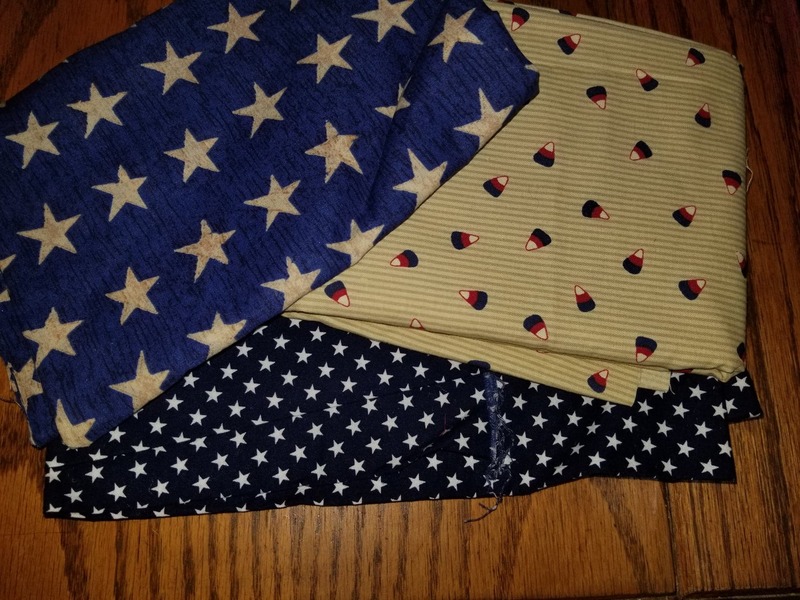 This entry was posted in Stash Report on July 15, 2018 by Jo. I’m sure that the parents of the children you care for know how much you do for their children. That 40 minutes is well deserved and I’m glad that you are taking it. As for Goodwill, I agree with you about it being expensive compared to other thrift stores. I don’t usually go in there, but might start just to see if they have fabric. Thanks for sharing. My goodwill never has anything that good! I’m a Goodwill shopper as well. 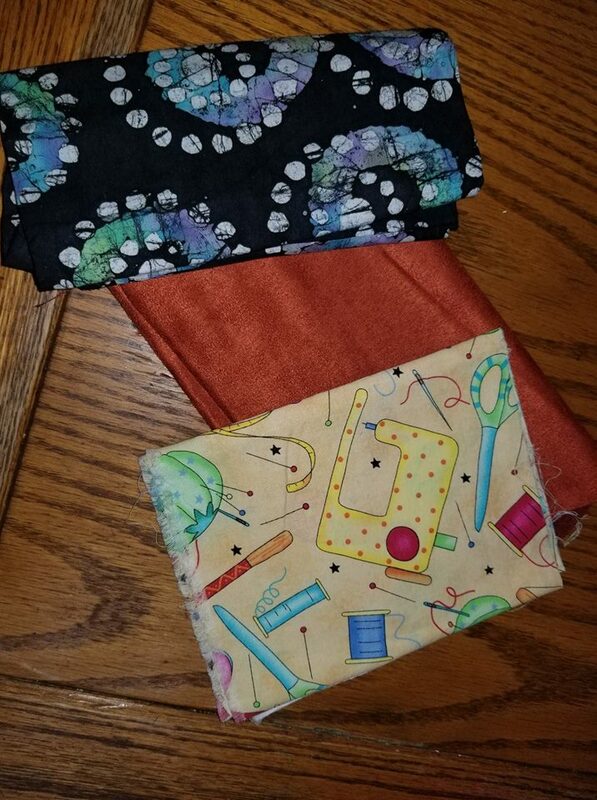 I thought I hit the jackpot this past week when I got two huge bags of fabric, one $6.99 and one $3.99. I should have opened the bag first, it smells horrible of smoke. I washed some and the big pieces came out ok but the smaller pieces were a jumbled mess. Darn. Your childcare parents are so blessed by you. Daycare providers are like teachers, you don’t have set times fo starting and stopping your day. It’s non-stop. When you tell of your childcare chronicles it reminds me of Wanda, the woman who helped raise my children when I worked. My kids still speak of her to this day, and how much fun they had at her house. I know your kiddos do, or will do, the same. God Love You! Enjoy your extra 40 minutes of time to yourself, you deserve it!! I can relate to Goodwill being too expensive on some items. I love to work jigsaw puzzles but rarely purchase them there. I can get them for 50 cents at a church thrift store nearby. They are up to $2 or more at Goodwill. Do you look at their online auction site? Prices on vintage sewing machines can go up fast. I had a friend who looked after her neighbour’s kids. It started out that it was until 4 each day, but then it gradually changed to 5 except Wednesdays when it was still 4 so that she could take her kids to church. She would get quite annoyed when the family called Wednesday “early day” because she felt like the other days were “late” and the time on Wednesday was what she had originally agreed to. I hope the extra time works well for you. Our Goodwill has never yielded fabric, in fact I have given up going. You are very lucky in what you find. I am amazed still that you devote so much time into every thing going on in your life! Very admirable. I love the thrift store finds too! There is always so much potential with them! Wishing you many more hours in the day to accomplish your work!